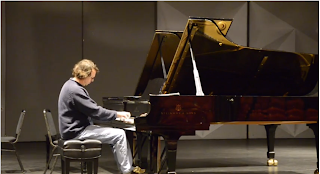 Jaehyun Park recorded the video of my performance of Schumann's Arabeske in C Major Opus 18 at our final studio concert at Stanford. I've posted the video here. It was a fairly insane quarter given I was defending and submitting my dissertation for my Ph.D. Between the Ph.D. and Smule, I didn't have time to finish the late Schubert Sonata, D958 in C minor, that I had started. Yet I couldn't help but learn the Scherzo and Largo movements from Chopin's 3rd Sonata while finishing my dissertation (I don't know why -- something about confronting my demons when completing the Ph.D.), but it wasn't ready either. So I played the Schumann Arabeske at the concert. Unfortunately there were a few memory slips. Oh well. I hope I have more time for piano now that I'm finished with my Ph.D.